At the end of the night, we raised $4,257.41 which means we were able to purchase 500 turkeys to donate to Catholic Parish Outreach, Inter-Faith Food Shuttle, Urban Ministries of Wake County, and The Salvation Army of Wake County. 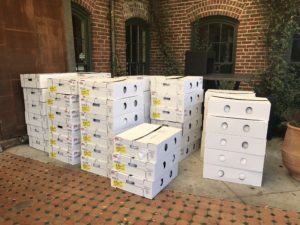 Here’s a picture of some of the turkeys getting ready to be delivered. We would like to thank all of our amazing sponsors who made it so all of the money we raised could go to help those families in need. Cheers to R.A. Jeffreys who provided all the wine and beer for the evening! We would also like to thank Sam Burkardt for capturing the evening perfectly in the images below. You can see more of her work at SamBurkardt.com. The Inaugural Turkey Ball took place on Thursday, November 8, 2018, at Mulino Italian Kitchen & Bar. For just $25, patrons were able to purchase a turkey for a family in need and they received one admission ticket and one drink ticket to the Turkey Ball. We had so much fun delivering the turkeys to our distributing partners. Check out the photos below.